US President Obama told the Australian Parliament in 2011 that the US was turning its attention to the ‘vast potential of the Asia Pacific Region’. The Pacific Islands region now finds itself in the middle of a re-engaged United States and rising Asia. As it attracts greater attention from both Asia and the US the region is well placed to take advantage of this increasing interest and associated economic and development opportunities. The shift in the centre of global economic gravity to the Asia-Pacific is diminishing the tyranny of distance for Pacific Island countries. The Asian century offers new opportunities to the Pacific. China has enjoyed significant growth as an economic partner to the Pacific. 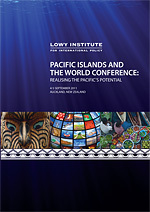 This paper is the edited version of the keynote speech delivered by the Lowy Institute’s Executive Director Michael Wesley at the conference, The Pacific Islands and the World: Realising the Pacific’s Potential, convened by the Lowy Institute on 5 September 2011 in Auckland, New Zealand. We live in the most dynamic region of the world.One third of the world’s Gross Domestic Product comes from the Asia-Pacific region.The region includes some of the world’s richest and poorest countries.It is Asia in particular that is responsible for the spectacular growth which is having a profound effect on the rest of the world. The Pacific Islands region contains a collection of culturally diverse and geographically dispersed countries which are at varying stages of economic development.Australia, PNG and Solomon Islands are experiencing strong growth as a result of the resources boom and high commodity prices but smaller countries are struggling with low growth.In the case of PNG and Solomon Islands, this growth has not yet been translated into improvements in the quality of life for a large number of their citizens. Newer aid donors are playing an increasingly bigger role across the world and our region, most notably China.China has enjoyed significant growth as an economic partner to the Pacific but other Asian countries such as Singapore, Thailand, Indonesia, South Korea, Philippines and India increasingly figure as trade and investment partners. Our political leaders have an indisputable role in guiding the response to the opportunity and risks that the Asian century presents to ensure the greatest possible benefits accrue to our countries at the lowest possible environmental, social and future cost.